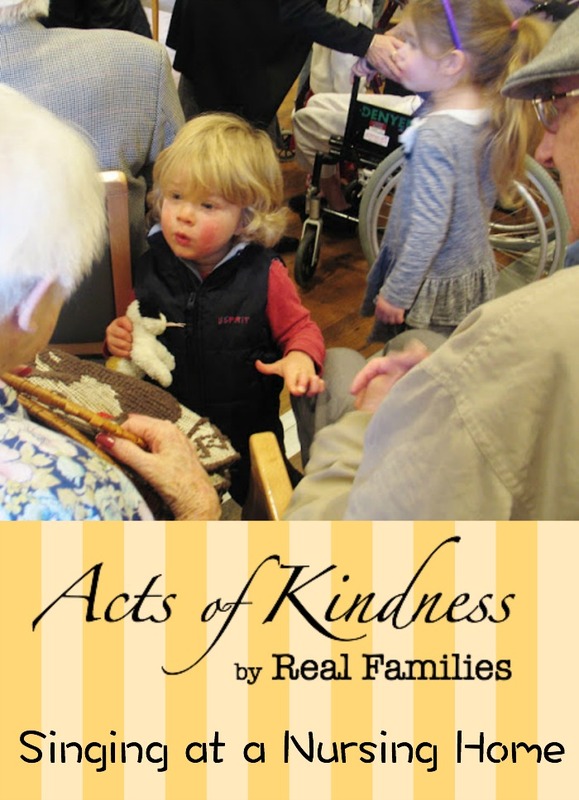 Acts of Kindness by Real Families is a series of short interviews featuring stories about service to others. Whether big or small, planned out or spontaneous, hearing about any act of kindness can inspire us to give more to those around us. 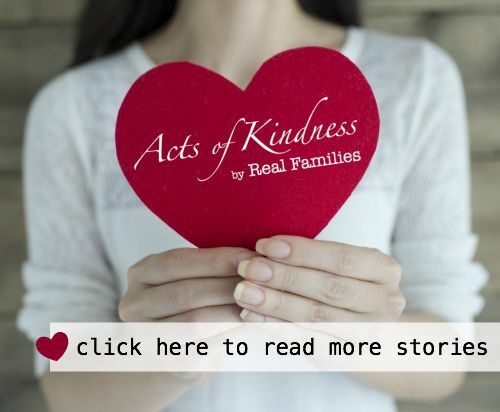 It’s fun to find new ways to show kindness in our communities, and I hope you will be inspired to get your kids involved in serving others through these creative ideas. This week I am honoured to have Kate from Living Loving Laughing sharing about her family’s experience singing at a nursing home. What happened: I am always grateful for any opportunity to bring my kids alongside when helping others. It makes an already rich experience even richer to have my little people there, eyes and hearts opening! A group from our church was heading to a local nursing home to do some a capella singing to entertain, cheer and bless the residents. Although outings those days were very rare as I was very sick with hyperemesis during my third pregnancy at the time, I was determined for our family to go as we usually would! Yeah. I can be stubborn sometimes too, I didn’t want us to miss out after missing so much already that year. I knew I wouldn’t be able to do much singing with the group, but I also knew it would be a blessing for the kids to spend some time with the elderly residents… and that those residents would also enjoy some of their sweet sunshine being spread around the place (whilst also hoping not to shatter the peace with any kiddie-tantrums! Ha). You can see a few pictures in this post. Message to others: I would really encourage any family with young children to look for ways to connect with your community and help others as a family, in whatever way feels right to you. I find it is a lovely way to build memories and it does great things for everyone’s hearts to take the time to ‘look outwards’ rather than just inwardly focus all the time (as kids, and let’s be honest, adults, tend to do!!). Nursing homes are a wonderful place to start. A simple visit, taking the time to chat with residents, can mean the world especially to those residents who rarely get a visitor. Thanks so much Kate for sharing your story! Kate blogs at Living Loving Laughing about family, fun, food, faith and fauxtography! 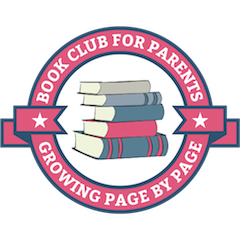 Stay in touch with Kate on Facebook or Pinterest. How to Deal with Tattling – In 2 Simple Steps!